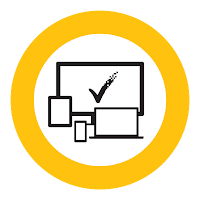 Norton Security Premium (a.k.a Norton Security with Backup) combines superior security and fast performance with an easy-to-use design to protect your devices from today's advanced threats. It safeguards your identity, protects your data, and keeps your computer running at peak performance. Norton Security Premium can protect up to ten of your devices-PCs, Macs, smartphones, and tablets, it includes premium family safety features so your kids can explore their connected world safely and offers 25GB of secure PC cloud backup, providing additional protection against ransomware. Moreover, Norton Includes a 100% guarantee, they’ll help you to keep your PC virus-free or will refund your money. Note: On September 2014, Norton products names has been replaced with new "Norton Security" products line. Norton Security Premium is equivalent to the old Norton 360. Disclaimer: Direct downloads for the lastest version of Norton Security Premium 22.9.3.13 are provided by the official software's author, we can't guarantee safety, availability or download speed. Moreover, we don't and we won't provide any pirated/illegal versions or tools. We recommend you to avoid it as these methods can harm your device. If you like the software, buy it to support the developers. (We provide software discounts for many worldwide brands).